NOTE: Information on live recordings is included for informational purposes only. Please do not write to inquire about availability of these recordings. Poor quality audience recording. Only known complete version of the amazing "Smells Like Teen Spirit-Stepping Stone" medley. First of 8 shows opening for Teenage Fanclub. From the St. Louis Post-Dispatch on 2/20/92: "Uncle Tupelo has started a 15-show tour that includes eight dates with Teenage Fanclub, whose album ''Bandwagonesque'' is No. 1 on some alternative radio charts. 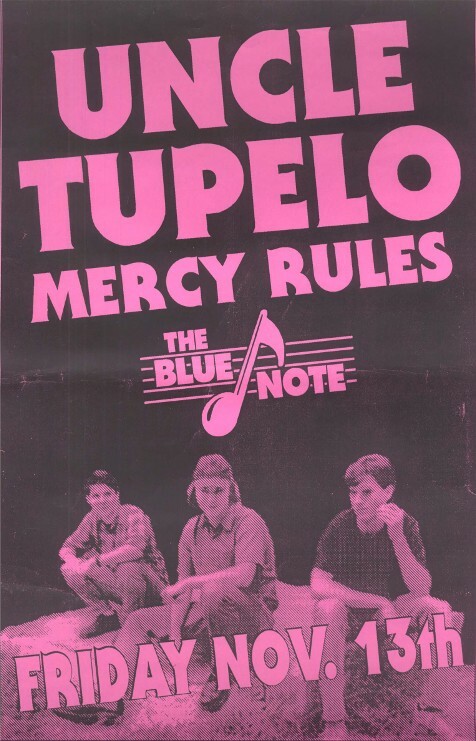 Uncle Tupelo manager Tony Margherita tells us that the band will be back in town for a performance in April." Soundboard recording. Opened for Teenage Fanclub. The tape is missing the first few songs. From the Boston Globe: "Uncle Tupelo, the opening trio, turned in a barnburner of Neil Young-ish country-rock, kickin' up a storm, but basically, seeming pretty normal about it. The punk-rock giveaway: Gang of Four's "I Found That Essence Rare." Audience recording. Opened for Teenage Fanclub. First few songs missing from tape. Soundboard recording, as well as a video (the video is missing the first two songs, click on the hyperlinks above to watch clips on Youtube). Last show with Teenage Fanclub, who joined UT for a loud version of "I Wanna Be Your Dog." Soundboard recording. Previously listed as 2/92 opening for Teenage Fanclub, but new information puts the actual date as 3/6/92. Ween opened this show. Very good audience recording. One of the band's very best performances, this tape has long been a fan favorite. Only known versions of "Brand New Cadillac," "The Concept" (inspired by the recent shows opening for Teenage Fanclub), and "Good Guys Don't Wear White." Tragically, the circulating tape ends half-way through the "Smells Like Teen Spirit-Steppin' Stone" medley. Here is a preview from the Chicago Sun-Times. Audience recording. Mike Heidorn's last show with Uncle Tupelo, and they marked the occasion with some covers that were standards back in the Primatives days. Small Ball Paul opened. From the St. Louis Post-Dispatch on 4/16/92: "UNCLE TUPELO returns to Miss. Nights April 23. And fans here will be glad to know that the hometown heroes have been getting international acclaim for their latest release, ''Still Feel Gone.'' Rolling Stone magazine lauded Jay Farrar and Jeff Tweedy for ''writ(ing) with an insightful eye and ragged beauty...'' The British publication ''Melody Maker'' put the album on its ''Hit List,'' and wrote ''. . .you'll shiver at the ghost town claustrophobia of 'Looking for a Way Out.' '' It described ''Still Be Around'' as the sort of song ''(Michael) Stipe might one day write when he's done with metaphysics.'' Doors open 8 p.m., show 9 p.m., Miss. Nights, 914 N. 1st St., Laclede's Landing. Small Ball Paul opens. $6"
Soundboard recording. This is the second of the four Coffee Creek shows. Many copies of this recording in circulation also include additional tracks from the 7/30/93 Coffee Creek show. Audience recording. The first show with Bill Belzer on drums. A newsletter from the band referred to this show as a "mudfest...in front of 7,000 people." The Gear Daddies were also on the bill, playing one of their final shows. This show is described in some detail in this article. 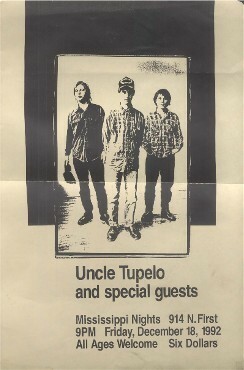 Uncle Tupelo was the surprise opening act for Joe Henry, who was backed by the Jayhawks on this tour. Soundboard recording. All acoustic set at a folk festival. Brian Henneman sat in for the entire set. First known version of "Moving Pictures" by Neil Young. The first night of the short-lived "Arkansas Traveler Revue" with Michelle Shocked, The Band, and Taj Mahal. Audience recording. It was at this show that the tour unravelled, with The Band leaving the tour, and UT following shortly after. The last date UT played on the Arkansas Traveler Revue. An article in the New York Times on October 13 included this cryptic statement about UT's set: " Ms. Shocked's touring Arkansas Traveler Revue also includes the group Uncle Tupelo, which updates rural styles with modern pessimism." The Draghounds and Five Easy Pieces opened. Audience recording, as well as video. First in a series of shows captured on audio and video by a zealous fan who flew in from California to spend his vacation following Uncle Tupelo around the Midwest. There are at least 3 different audience recordings of this show, all are very good quality. Click on the hyperlinks above to watch clips on Youtube. Here is a preview from the Chicago Sun-Times. Audience recording, as well as video footage filmed with a tripod. Click on the hyperlinks above to watch clips on Youtube. Audience recording, as well as video footage filmed with a tripod (click on the hyperlinks above to watch clips on Youtube). "Bill Clinton From Arkansas" was a silly tune written by drummer Bill Belzer in celebration of Clinton's victory in the election. Bill played guitar on this while Jay Farrar played drums. Audience recording, as well as video footage filmed with a tripod (click on the hyperlinks above to watch clips on Youtube). Technical problems limit the end of the show to acoustic instruments. Only known performance of "The Weight" by The Band, though it was a very rough and unrehearsed. Audience recording. Start of a brief tour supporting Bob Mould's band Sugar. Acoustic set. Soundboard recording, sometimes listed by traders as "Melkweg 1993." There is also an audience recording of this set. A newsletter from the band mentioned that they would do "...a week in mid-December in and around London." However, this seems to be the only show that was played. Audience recording. Here is a preview of this show from the St. Louis Post-Dispatch.